During my recent trip to Kaohsiung, Taiwan to present at the Asia-Pacific Educational Research Association – Taiwan Education Research Association 2016 conference, I was able to meet up with my friend Grace from Taipei. 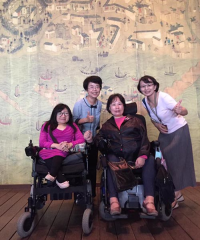 Grace is a staunch disability advocate in Taiwan. Grace kindly invited me as a guest to visit the National Museum of Taiwan History. We were met by the chief curator of the museum, a gallery interpreter, as well as the public relations person from the museum. The director of the museum also came to greet us during our visit. The curator took care to demonstrate to us the walker-chair as well as other assistive devices the museum has provided, free of charge, to anyone who requires it. Both the director and the curator were very keen to learn about the accessibility of museums in New Zealand, and more than once I was asked if their museum matched the standard of Te Papa in Wellington. Original generation time 1.5403 seconds. Cache Loaded in: 0.0393 seconds.